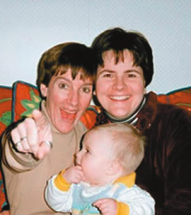 Ex-gay activist Debbie Thurman sent a note today to supporters of Lisa Miller, the self-declared ex-gay woman who violated Vermont family-court visitation rulings that favored her ex-partner Janet Jenkins, took her daughter to Virginia in 2004, and continued to violate a series of subsequent state and federal rulings. Readers may recall that Miller has been championed by Christian Rightists and ex-gay activists for her claimed victory over homosexuality and for violating Jenkins’ visitation rights — even though Miller later admitted that she had not really been sexually attracted to her ex-partner, and therefore she was never really lesbian. In case you haven’t stopped by the Only One Mommy group lately, I wanted to make sure you all knew that Lisa’s Liberty Counsel attorney, Rena Lindevaldsen, announced there that the next appeals hearing in Virginia (addressing enforcement of Vermont’s court orders) will be on Dec. 9. I know you all will want to be praying for a positive outcome. As Rena said, a favorable ruling from the appellate court in Virginia that is either not challenged or survives a challenge in the Virginia Supreme Court or SCOTUS would effectively mean Lisa and Isabella would be free and no longer bound by Vermont’s dictates. That is potentially very big news. I also want to take a moment and salute any members who are veterans today. And happy birthday to you (yesterday) if you also happen to be a Marine. In that vein, you may wish to visit my blog and read both today’s and yesterday’s posts. Freedom isn’t free, and we have much to be thankful for. In fact, let me also take this time to wish each of you a happy Thanksgiving upcoming. Bless you all. Thank you for standing firm in your prayers for this case and for all concerned. Strangely, we still await Vermont Judge Cohen’s delayed ruling on a possible change of custody. Keep praying. Thurman and the Liberty Counsel both seek to undermine the nation’s family-law system by enabling states to violate one another’s family-court rulings and thus to harbor deadbeat dads, non-custodial parents and their kidnapped kids, and other fugitives from justice. Far from upholding freedom, Thurman undermines not only the religious freedom but the freedom-to-parent of those who lose their children to lawbreaking ex-spouses.